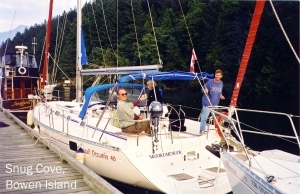 I’ve met a few sailors who have circumnavigated the world, and a few more, Vancouver Island. But I’ve never met anyone who has gone around CPS Island. Where, you ask, is CPS Island? 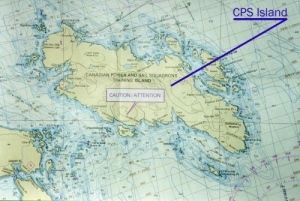 On “Training Chart A” used by the Canadian Power & Sail Squadron (CPS) in their Boating Course, this island is located 10 miles west of Vancouver, British Columbia. A “CAUTION” label indicates: “This island does not exist. It is inserted on the chart for instructional purposes only.” In fact, the island does exist although it is called “Lasqueti Island” and is located 50 miles up the coast from Vancouver. As an Instructor in the Boating Course, I conduct a classroom exercise where students circumnavigate CPS Island, about 25 miles around, reviewing newly acquired boating knowledge. When my co-instructor David Levine and I asked students how many would like to conduct this exercise in “real life,” eight eagerly signed on as crew. 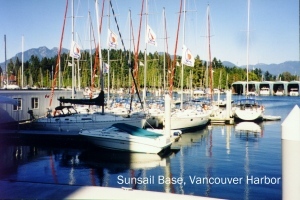 Sunsail in Vancouver provided two 40′ Beneteaus mid-September, “shoulder season” on the West Coast. Two months prior, we outlined the learning objectives that each student would have to complete to receive a “Competent Crew Certificate:” pick up a man-overboard, sail a figure-eight pattern, heave to, shorten sails, anchor, dock, calculate tides and currents, determine Fixes, and solve time/speed/distance problems. We all arrived at the Bayshore West Marina in Vancouver Harbour by noon Saturday, stowed our gear, shopped for food and met with Mike from Sunsail for our boat orientation. When we told him our plan was to sail around Lasqueti Island, he said he wasn’t familiar with that area because it was “off the beaten path.” We didn’t even mention CPS Island! The next morning, after sleeping aboard, we motored under the Lion’s Gate Bridge on our way to Snug Cove on nearby Bowen Island. A light breeze was ideal for practicing various “points of sail” and man-overboard drills. We docked with time to explore this quaint little village which also serves as a ferry terminal. A great day of sailing followed by a BBQ in the cockpit introduced students to the “cruiser’s credo” … enjoy the voyage, as well as the destination. We departed early in calm conditions on the longest leg of the trip, 35 miles up the coast to Smuggler Cove. Each day, two students were responsible for navigation; the other two for handling the boat. The navigators obtained weather reports, constructed a tidal graph, plotted our course, took bearings and kept track of our progress. The helmsmen checked the engine, stowed loose gear and steered the course provided. 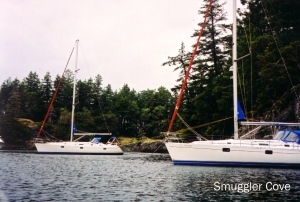 In Smuggler Cove we anchored and tied stern to shore, using rings attached on a rock face. Exploring this popular marine park by dinghy and by hiking the surrounding trails was a delightful experience. 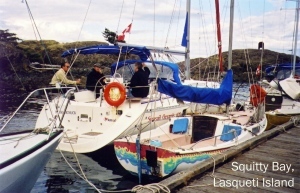 On day three in a 15-knot southerly, we “beat” our way to Squitty Bay Marine Park on the southeast corner of Lasqueti Island, the start of our circumnavigation. This tiny notch has no facilities except for a small public float extending parallel to the narrow entrance. Because maneuvering room is limited, anchoring is not an option. David’s boat, Klahhanie, arrived first, taking the last available dock space. We rafted Skookumchuck next to two smaller boats. One interesting sight a short walk from the dock is an “onion tree.” Someone hung dozens of sea onions upside down from the branches and braided the tentacles below the bulbs, giving an eerie appearance to the landscape. At sundown we decided that “Lasqueti” is an Indian word for mosquitoes; hatch netting would be useful on future visits. Light winds the next day allowed students to practice sailing figure eights (tack, gybe, gybe, tack) and heaving to. They also practiced anchoring in Jenkins Cove, one of several small bays on the south shore. Students took turns at the helm, setting and weighing anchor, while directing the crew operating the anchor windless. After lunch we motored the remaining five miles to False Bay, anchoring in the northwest corner. The “Qualicum Winds” which blow eastward from Vancouver Island can deliver large swells to boaters who are not tucked in behind the islands. Across the bay is Lasqueti, the only settlement on this island, with its ferry terminal, restaurant, hotel, and small store. No showers were available to boaters so we decided to try our own. To ration water I introduced the crew to “Navy showers” — 30 seconds to get wet, then soap down, and another 30 seconds to rinse off. Five crew can shower with just ten gallons of water. Since the hot water tank only holds six gallons, the Captain got first dibs! The next day we motored around the west end of the Island into Scottie Bay, one of the most protected and scenic bays in the area. Here, after a demonstration, each crew had an opportunity to anchor, and reanchor if necessary to ensure a secure set. After lunch we continued east, practicing navigation skills, to our evening anchorage in Deep Bay on adjoining Jedediah Island. We had heard from other boaters that this marine park is a “magical place” and that a horse has lived on the island all of his 30+ years. We were looking forward to meeting “Chuck,” fondly named after last night’s meal of chuck steak which bent a few forks in the eating! We completed our circumnavigation the next day by departing the east end of Lasqueti. “Small craft warnings” prompted us to shorten sails. Even with just half our sails unfurled, we managed an invigorating 7 kts, taking turns at the wheel in the big winds. Lots of smiling faces all around! Students learned the importance of stowing items securely – cameras, GPS’s, charts, and various food items were strewn about the cabin floor when we docked in Secret Cove. The Jolly Roger Inn perched high on a hill provided dinner and a spectacular view of the marina at sunset. Early next morning everyone took turns docking at a vacant slip before motoring south on a “rippled sea” to Gibsons Landing. 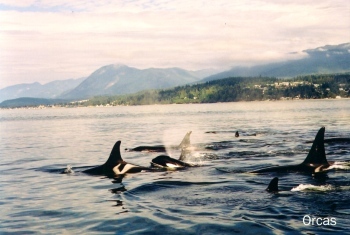 Along the way, we shut off our engines when encountering a pod of killer whales (Orcas), seemingly oblivious to our presence. Although there has never been a reported case of killer whales eating a human, we chose to record our Kodak moments from the cockpit! We felt honored by the opportunity to observe these magnificent creatures frolicking in their natural environment. Gibsons has a large protected harbour; it’s fun to walk the docks, checking out the various boats and dreaming of ownership. We “went Greek” at Leo’s for dinner and “went Beachcomber” at Molly’s Reach for breakfast. Our last day took us around the backside of Bowen Island into picturesque Howe Sound. Rounding Point Atkinson, we approached Vancouver “wing on wing” with many other sailboats enjoying the fine Sunday breezes. All students had successfully completed the learning objectives, but as we neared Lion’s Gate Bridge, there was one more lesson to be learned. An outbound freighter was blowing its horn to warn the numerous boaters of its approach. We angled away, just as it turned and headed in our direction. A sharp right turn took us well out of the shipping lane as the freighter passed within 200 meters. Shortly after, three Coast Guard officers in a Zodiac pulled alongside advising us that the Captain of the freighter had reported two sailboats in his path (they are required to do so if they lose sight of a boat from the bridge). 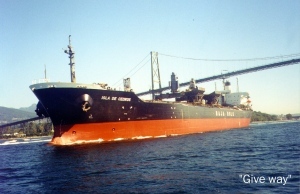 He politely recommended we give freighters a wider birth as the Captain has limited visibility in front of his vessel. This lecture was not part of our curriculum, but proved to be a valuable learning experience for all of us. Back at Sunsail, each student reported on his or her highlights. Everyone mentioned the Orca encounter and most referenced our time around Lasqueti: off the beaten path, scenic bays, the onion tree, and the magical walk on Jedediah. Others mentioned sailing in big winds, sharing responsibilities, learning new skills, and a sense of camaraderie that comes with working as a team at sea. All students expressed increased confidence and were eagerly discussing future circumnavigations — the “world” was now considered a possibility. If you’re considering a cruise, either through a charter company or perhaps on your own boat, the author strongly advises that you “learn before you cruise.” Sailing away on a live-aboard yacht can be a fun-filled adventure, one that can turn dreams into reality. It can also be a terrifying disaster for those with little knowledge or experience. Fortunately, knowledge can be acquired through classroom courses provided in Canada by the Canadian Power & Sail Squadrons, and in the United States by the US Power & Sail Squadrons. 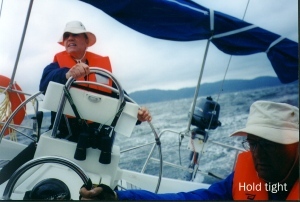 These courses range from Basic Boating to Advanced Piloting and Celestial Navigation. 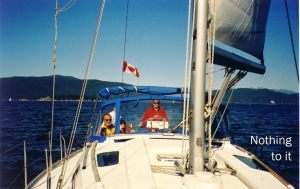 Experience can be acquired through the Canadian Yachting Association and through charter companies such as Sunsail which offer “hands on” courses where students spend time on the water under the guidance of a qualified instructor. When you begin to feel confident handling a big boat, consider going on a flotilla charter where you are in charge of a yacht but a qualified skipper is on a nearby boat to offer support if required. Sunsail also offers flotilla sailing at several of their bases around the world. Increased confidence comes with increased knowledge and experience — there are no shortcuts to safe boating.